The core of any modern media blasting facility, a properly designed and engineered blast room meets the demands for a clean, non-toxic environment while providing a return on investment. Titan Abrasive blast rooms are engineered to your specific application. Whether you need a turn-key 10’ x 15’ blast room with a vacuum reclaim system, or a more elaborate room with bucket elevator, cross screw and a dust collection system, you’re assured of highest quality and rugged dependability – all at a price that is the lowest in the industry — because we cut the middleman and sell direct to you. 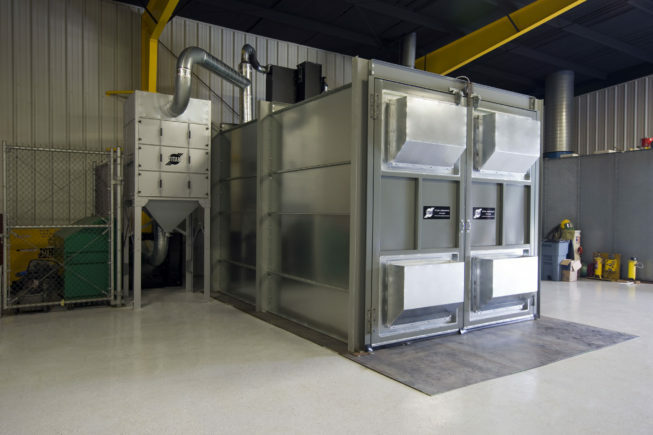 The blast room enclosure contains the abrasive and abrasive dust, allowing the abrasive to be cleaned and reused. Titan blast booths consist of easy to assemble flanged bolt-together galvanized steel panels, available in 14 or 11 gauge. Standard on all our blast booths are a personnel door and double swing-type product entry doors on one end; pass-through blast booths with doors on both ends are available. LED lighting and polycarbonate light covers are also available. Titan offers optional multiple operator packages, including additional blast machines and large capacity media storage hoppers. Electric controls can also be substituted for the standard pneumatic controls. Titan offers two styles of media reclaim systems, mechanical and pneumatic, depending on the application and desired abrasive to be used. Blast Room with Mechanical Media Reclaim System – Fast and dependable, Titan bucket elevators incorporate gravity-fed air-wash separators and vibrating screens to clean and classify media. Blast Room with Pneumatic Media Reclaim System – An economical alternative, vacuum reclaim systems utilize cyclone separators to recover usable media to the blast machine, while dust and broken-down media are drawn out into the dust collection system. Note: Cyclone separators work best with lightweight media. If aluminum oxide or other aggressive abrasives will be used, consider ordering the optional rubber-lined cyclone. Please see our Media Reclaim Systems section for technical details of each system. If you’re not sure which system is right for your application, please contact us for assistance. The dust collector is one of the most expensive components of the blast room, and also the most important. Titan cartridge dust collectors are sized to fit each individual room according to room size, parts being blasted, amount of dust from the blast media, and airflow required for the abrasive media cleaner. Titan’s completely redesigned Cartridge Dust Collector cleans its filter elements with periodic pulses of compressed air that momentarily reverse the flow of air through the filter element. This pulse knocks the caked-on dust into a hopper or dust drum below. The most affordable in the industry, Titan’s reverse pulse Cartridge Dust Collectors feature a compact footprint and significantly improved efficiency over older baghouse dust collectors, which rely on large quantities of bags or socks to filter air.